Prayer can be wonderfully accessible to everyone. "In learning to pray, no laboratory is needed but a room, no apparatus but ourselves," Douglas Steere writes. Aware of how easily we can be intimidated by complex methods, Steere suggests that we begin by simply acknowledging our dependence on God. Prayer comes as a response to a God who "besieges us with love," he says. 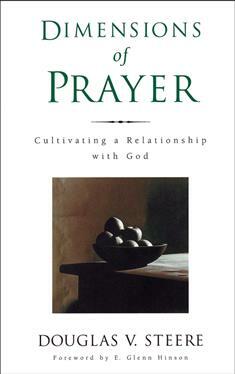 In Dimensions of Prayer, Steere answers common questions and concerns about prayer. Among the topics covered are petition, confession, adoration, intercessory prayer, and how to cope with dry times in prayer. This easy-to-read book offers new "pray-ers" an engaging introduction to prayer while providing valuable wisdom for mature Christians.